Like every year, the 11th grade class took the road towards our French-Canadian neighbors. Kali Coles, David Eichler and I accompanied some 18 students to Quebec during a short week, which happened to be at the peak of the autumn foliage season. The drive up along the Kennebec river was exceptionally beautiful and it put every one of us in a very excited mood for what was to come! As always, we stayed at the Auberge International of Quebec, conveniently situated in the old town near the Porte St Jean, which allowed us to walk to our various destinations. It was a very busy four-day visit with many varied moments highlighting Quebec history, traditional food, musical culture, circus culture, religious history, and more. One of my personal highlights was our musical evening animated by Martin and Capucine Aucoin, two excellent Quebecois musicians who led a musical workshop: a fiddle tune learned by ear for the few students who brought their instruments, call and response Quebecois song, foot tapping and contradancing. Martin is the administrator for the “Centre de Valorisation du Patrimoine Vivant de Québec.” We all experienced two hours of wonderful music and fun. Our students proved to be rapid learners and energetic dancers. They were beautiful ambassadors of their Waldorf musical training! A fabulous afternoon was spent in the company of Ibrahim and Simons, two very talented teachers at Ecole du Cirque de Quebec. For three hours our students jumped on trampolines, raced on barrels or unicycles, climbed or balanced on ropes, juggled, and challenged themselves in multiple circus stations with lots of laughter and enthusiasm. What fun it was to observe their youthful energy and their incredible physical skills! One day, after a traditional French breakfast of croissants and hot chocolate, we left for an excursion about 30 km away from Quebec, in the Canyon of Ste Anne. Despite the sullen weather, the students were able to enjoy their walk through the colorful forest and experience the awe of crossing the raging waters on high suspended bridges. Later, we visited another place of power, this time man-built – the Neo-Romanesque Basilica of Sainte Anne de Beaupré. It was a day charged with beauty and reverence. 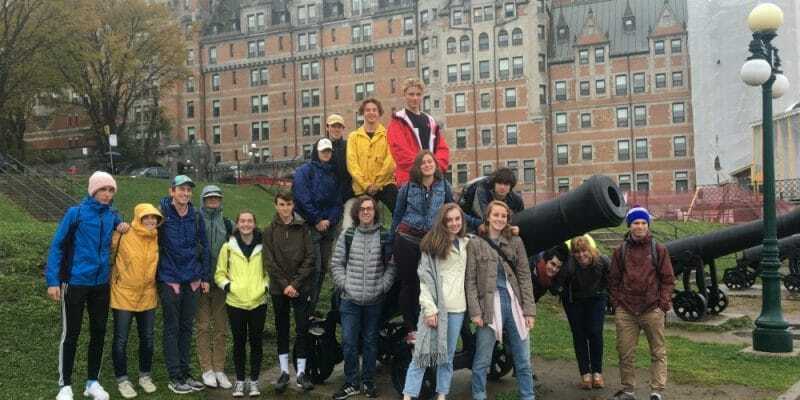 The history of our francophone neighbors was another theme presented to our students formally through varied museums exhibitions as well as, informally, when they encountered cannons or statues as they explored the old cobblestones streets. On our last night, a ghost story teller took us all on the quay of the St Lawrence river in dark alleys and ancient courtyards, recalling in a dramatic voice REAL stories of ghosts and murders taken out of the archives of ancient Quebec. Many of us shivered along and not just from the cold! I believe our students have been greatly enriched by this historical, cultural, and linguistic discovery of Quebec. Many of them had fun trying out daily their French language skills in cafes, restaurants, and shops. Suddenly, all those years of learning French made sense! Many students are planning to return soon with their families to the old city of Quebec, this time being the guides for their family. Our students revealed themselves to be good ambassadors of their school and their country, and I often received compliments on how well behaved and pleasant they are. I want to thank my colleagues, Ms. Coles and Mr. Eichler for being helpful and efficient chaperones, as well as wonderful travel companions, and our 11th grade students for being cooperative and respectful young people. Vive le Voyage à Québec! Biodynamic Beekeeping Workshop with Gunther Hauk is this Saturday! Register today!